I love an excuse to dress up. And what girl doesn’t love the chance to wear an oversized hat at the same time!? 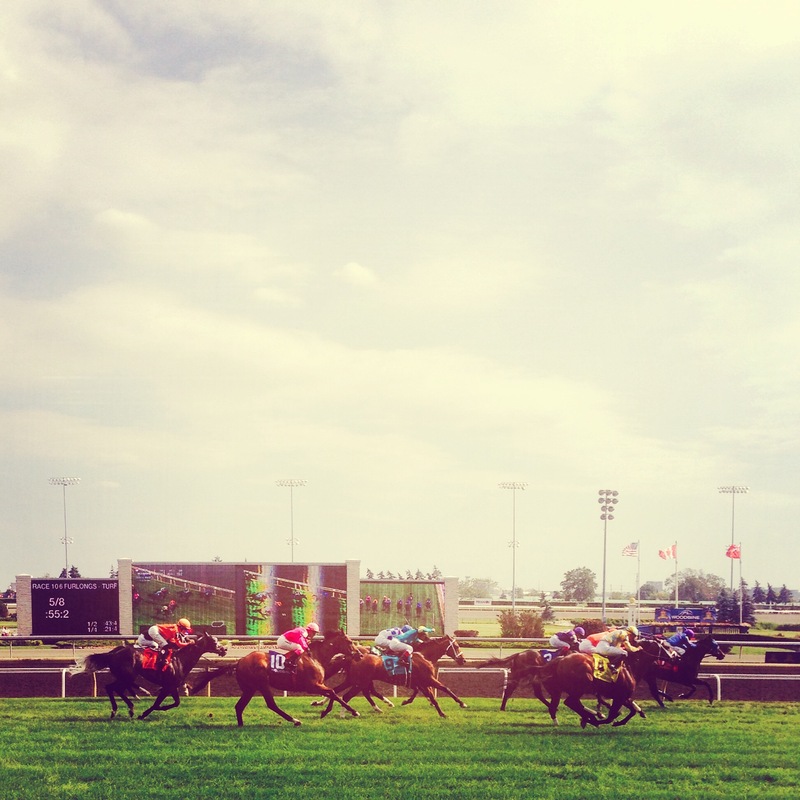 This Sunday, a group of friends and I decided to get fancy and take a limo to the Queen’s Plate at Woodbine Racetrack. It was an absolutely wonderful, and very affordable, way to spend a Sunday. Tickets were only $31, and after splitting the cost of the limo (to avoid any drinking and driving and/or complications with hailing a taxi in a gigantic crowd) the day worked out to just $65 per person. In addition to a full day at the races, a track level party for all ticket holders was included in the price of each ticket. The party, called “Hats and Horseshoes“, featured two bands (one of which was my wedding band, Emerson Street Rhythm Band, so naturally, it was very exciting for me! ), multiple food trucks, several betting kiosks, and as many adult beverage booths as the eye could see. Above the stage there was a screen set up showing each race leading up to the the Queen’s Plate itself, ensuring you did not miss a thing. The party was split partially due to a walking ring through the middle, which was really neat, as you were able to watch each horse go by on its way out to race. The grounds were covered in women wearing the most incredible fascinators and gigantic floppy hats – It was fabulous to see. Although the wind was a bit of a task for all of us; One minute you felt like a princess and the next you are hightailing it across the pavement after your chapeau! Even the gentlemen were turning it up: we saw quite a few men in penguin suits – including top hats – it was spectacular. The whole day was a wonderful mix of young and old, groups of friends, and large families embracing the opportunity to get dressed up and have a lovely time in the sunshine. And that, I am definitely on board with. I think this is an event that we will be attending for many years to come!